Like anything, there are many generic imposters in the tungsten jewerly industry. If you find a tungsten ring that is significantly discounted, you have found a generic knock off! It is not physically possible to produce a tungsten band at significantly low prices without using inferior or impure materials. The tungsten material itself costs more than that. Also, most jewelry manufacturers use a low quality binder material to reduce costs. But these short cuts result in brittle, softer, discolored and less brilliant rings, which will not last as long as a quality tungsten ring. Tungsten alone is a very dense and fragile metal, not very ideal for jewelry. When tungsten is combined with carbon alloys at over 6,000 degrees Fahrenheit, Tungsten Carbide (TC) is formed- one of the hardest metals known to mankind. Although Tungsten has been used for many years in the manufacturing industry for tools and other workmanship, Tungsten was introduced to the jewelry industry merely a few years ago. 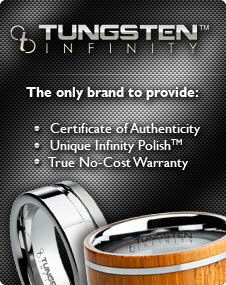 The Tungsten InfinityTM collection does NOT contain the alloy cobalt. Although cobalt allows for easier production, it reacts with the natural oils in our skin and will cause oxidation on the ring (Beware of competitors selling generic tungsten rings containing cobalt, they are not scratch resistant and will oxidize and discolor quickly). Most manufacturers use an alternative binder, such as nickel, to combine with the tungsten material. The tungsten ring quality is very much related to the binder quality (see the Quality section below). This indestructible alloy is virtually impossible to scratch, and holds its shine for decades! Here are some interesting facts that will put into perspective the quality of Tungsten Carbide - Tungsten Carbide is approximately ten times harder than 14K gold, and four times harder than platinum! This innovative new product has become the hottest trend in today’s jewelry and wedding band market. Even though tungsten wedding bands have been available over 5 years now, many people have not even heard of tungsten jewelry. Tungsten carbides are compounds of tungsten and carbon: monotungsten carbide (WC) or ditungsten-carbide (W2C). A tungsten carbide compound is denser than silver, steel or titanium, and jewelry made of it is effectively wear proof. Pure tungsten jewelry is available; however, pure tungsten is not as hard as the carbides. This is why Mens Tungsten Online uses only THE STRONGEST TUNGSTEN CARBIDES in our collection. What was once a metal most popular with people working heavily with their hands tungsten is now becoming more and more mainstream. Because of its ability to resist scratching and its polished look, tungsten rings are becoming more and more popular with men and women alike. No matter what the reason, we will replace your ring. All we require is a copy of your receipt, your original ring and the return form. If you have any questions, please call us at 1-888-699-8076.